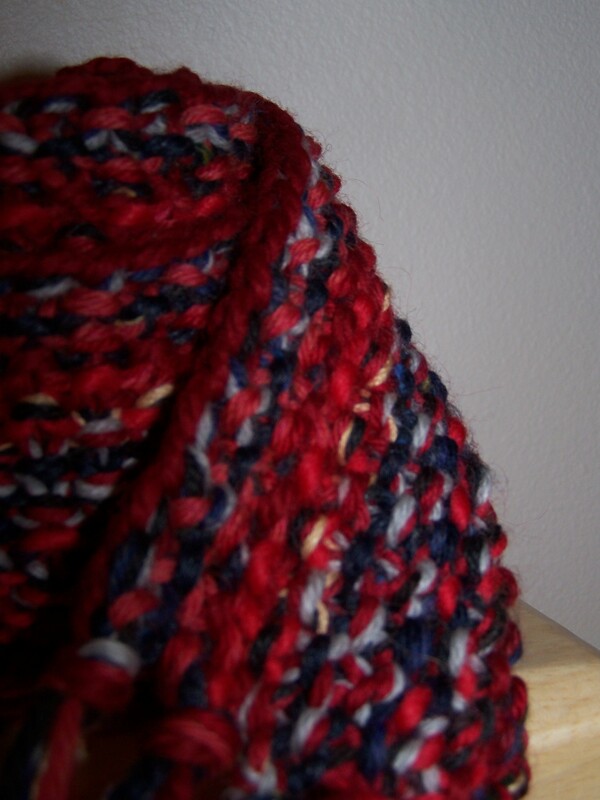 random scarf for some random posts..."Spontaneous Scarf"
I am figuring out easy ways to run errands and get around. Last week I caught a bus to the chiropractor then over another one to BF’s house, all on one fare. Today I plan to hit the post office, bank, and doctors office on my way to see him. He’s got strep :-(. More savings associated with the selling of the car! 🙂 I am getting about a $100 refund from the dealer who sold me the car on the unused portion of my GAP insurance. I paid my loan off a year early so they owe me around a hundred dollars- cool! I am back doing Dinner’s Ready again. BF and I love to cook! But cooking on weeknights can be a bit lengthy and our grocery bills were high. I suggested we try Dinners ready for weeknight cooking. We get a bunch of meals in a mix of 2 serving and 3-4 serving sizes. We keep the 2 person ones mostly at his house and the 3-4 person ones at my house- that way we cook for Mom too. We did it in December and I saw a great reduction in my grocery bill in January. Plus it’s fun- He and i go to assemble our meals together which saves us 10%, we save another 10% by ordering 16 meals, and we also save $15 through an employer discount. After all of the discounts our meals cost between $5.50 and $5.75 per serving. Can’t really beat that. Meals usually come with a side so we usually add either a veggie or rice depending on the side. Finishing projects up! Keeping myself honest below is the original list. I finished a pair of blue and green baby booties for my friend from high school. Very cute. Instead of working on the pink scarf, I finished a spontaneous scarf which I started last spring for BF- he likes his alpaca scarf instead so it’s become a scarf without a home. I am still searching for a baby gift for one more boy who is one the way… ideas appreciated. Felted baby chicks for ??? Did you follow the recipe? Project: Organize BF’s loose recipes in a ‘manly’ recipe box. Cooking together has been a central part of our relationship and I dare say that BF has accumulated a good collection of recipes from various sources. What’s our favorite place to pick up recipes? Central Market the higher end grocery store in our neighborhood. Central Market recipes are printed on three hole punched half sheets which fit nicely into these mini three ring binders. So what’s the problem? Most of the rest of the recipes that BF has been accumulating are clipped from magazines, printed from the internet, or created by us and jotted down on any random scrap of paper. Me, I have a well stuffed recipe box, but he has nothing of the sort. 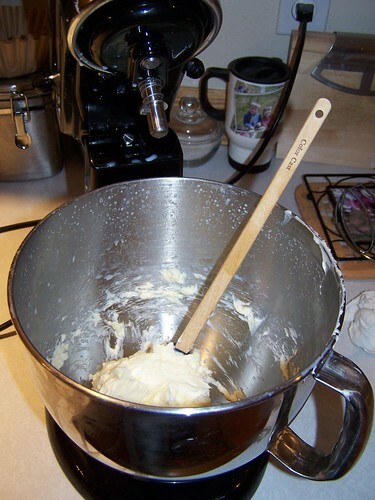 So, while he was visiting his folks after Christmas I swiped the pile of loose recipes and got to crafting. I started with a plain unfinished wood box, paint, decorative paper mixing bowls and cool metal discs stamped with letters. 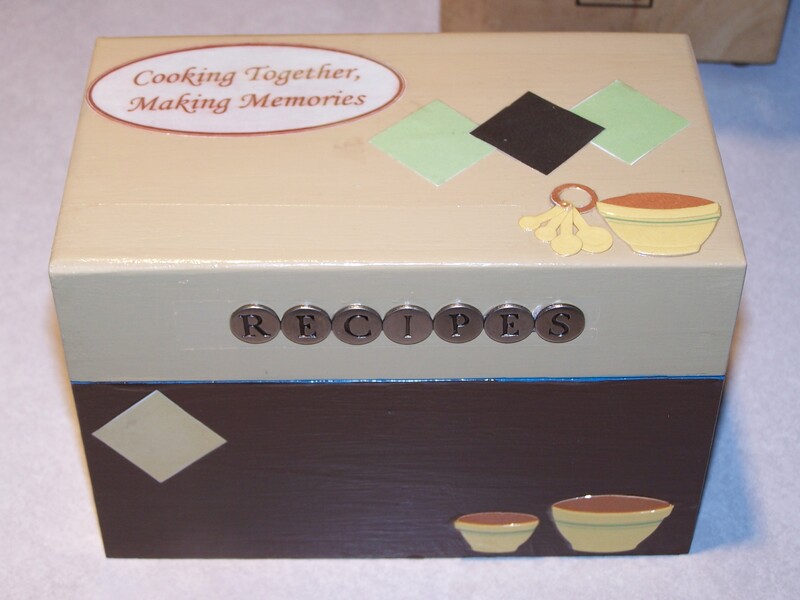 The end result- a personalized box that matches his kitchen. A funny personal touch- the inside (which I lined with decorative paper) poses the question “Did you follow the recipe?” inside the lid. What a silly question, recipes are merely a starting point. J Another funny tid-bit, it is imposible to find the preprinted dividers for recipe boxes by themselves. You can buy recipe cards or whole box sets (box, tabs, and cards) but not just the tabs. Cost: $$ it cost about 3 times what the premade box sets cost- but I think it was worth it- especially because it was a lot of fun to do.